Churches worth seeing, XII | Sed Angli. St. James Church : Lake Delaware, N.Y.
ST. JAMES CHURCH in Lake Delaware was designed by that great American Gothicist, Ralph Adams Cram, and is though to be—with All Saints, Peterborough, N.H.—Cram’s perfect church. George Ashton Oldham, the Bishop Coadjutor-elect of Albany, laid the cornerstone on St. James’s Day in 1922, and the church was consecrated by then-Bishop Oldham on St. James’s Day, 1924. Constructed of brown shale taken from local fieldstone fences and of Indiana limestone with a slate roof, the design of St. James was influenced by the 12th-century St. Mary’s Church, Iffley, Oxford. At St. James, though the pointed arch characteristic of the Gothic is present, the church is dominated by the heavy masonry that clung to the churches of the late Romanesque. The walls are thick and solid, their mass broken only by comparatively small window openings. The interior walls are of white plaster, applied with a mason’s trowel giving it a wavy surface but a smooth texture. To the north of the nave is the Lady Chapel, its walls and ceiling decorated with blues and gold leaf. The chapel altar is embellished with a cross created by the carving of four pomegranates, symbol of the Resurrection of our Lord, enclosed within a circle and quatrefoil, symbols of completeness and perfection. Also carved on the altar are two symbols of the Virgin Mary, the crescent and star, and the book surmounted with a crown. 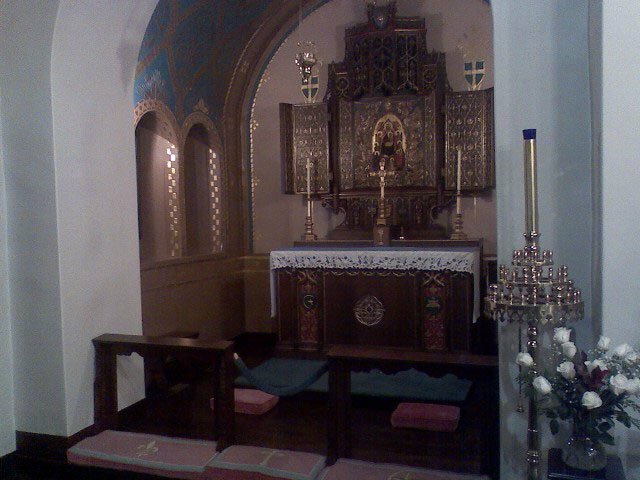 The altar cross contains the symbols of the four Evangelists and the Lamb of God. The center panel of the triptych above the altar contains a 13th-century Florentine painting of the enthronement of Mary. The triptych is crowned with the Sun-burst, a symbol of God the Creator. The frame of the reredos is embellished with the grapevine, symbolic of the Holy Communion and of the Church. The pomegranate and roses, which are symbols of the Resurrection and the Incarnation of our Lord, may be seen in the upper portion of the reredos. St. James, Lake Delaware, is a Cram original. 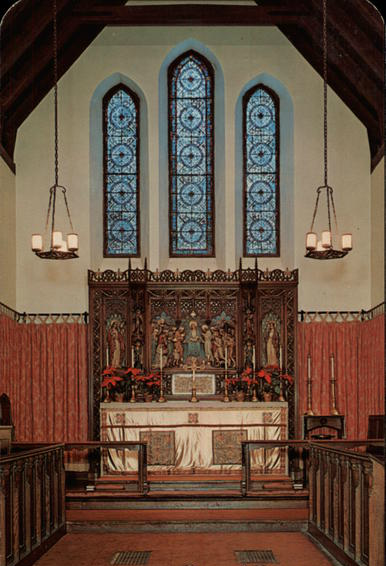 Like the other great Gothic Revival architects working in the early part of the 20th century—Henry Vaughan, Bertram Goodhue, Charles Coolidge Haight—Cram had a total command of the medieval architectural vocabulary. His churches, though informed by earlier European precedents, are derivative of no single building… nor of any collection of buildings. The inspired application by these men of the forms, proportions, and building methods of the Gothic to an American context has shaped the way in which we conceive of the religious and academic life in this country, just as architects such as Delano and Aldrich, McKim, Mead and White, and John Russell Pope shaped how we think about the domestic and the civic, and all have had a profound impact upon our national life. 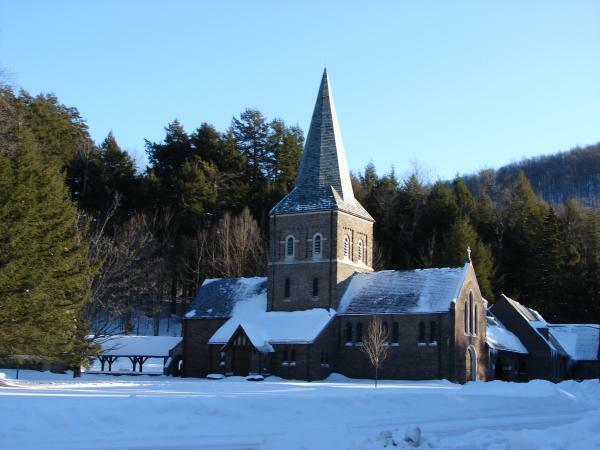 This fine church, nestled between the mountains and the Little Delaware River, is well worth seeing.